The Rev. Charles N Sims (the initial ‘N’ stood for nothing) was elected in 1859 as the first president of Valparaiso Male and Female College. 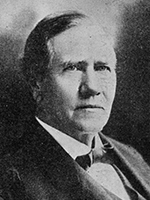 However, he had to defer his arrival to Valparaiso for a term, during which time professor Francis D. Carley served as acting president. When Sims arrived, he was also instated as professor of ancient languages and literature. He had previously served as principal of Methodist Thorntown Academy. In 1860, a permanent three-story brick building was constructed and the fall enrollment was 327, up from the first-year enrollment of 75. Sims’ tenure as president was cut short by poor health and he resigned in early 1862.